French fries with a cup of ginger tea. This was our routine tea time snack at office with my colleagues when we moved to a new location which had a variety of food outlets. Don't ask me how much I gained out of this junk food. But I badly wanted to change this habit. I am not able to figure out how french fries doesn't lose its popularity among my colleagues even after routine eating. Though I used to bring some fruits as snacks, I get tempted when my colleagues buy the fries and I end up grabbing some from their plate. Do you know my hands won't listen my mind!! :-) Days passed, everyone felt guilty over a period, most of my colleagues slowly changed to juice and other alternate snacks. 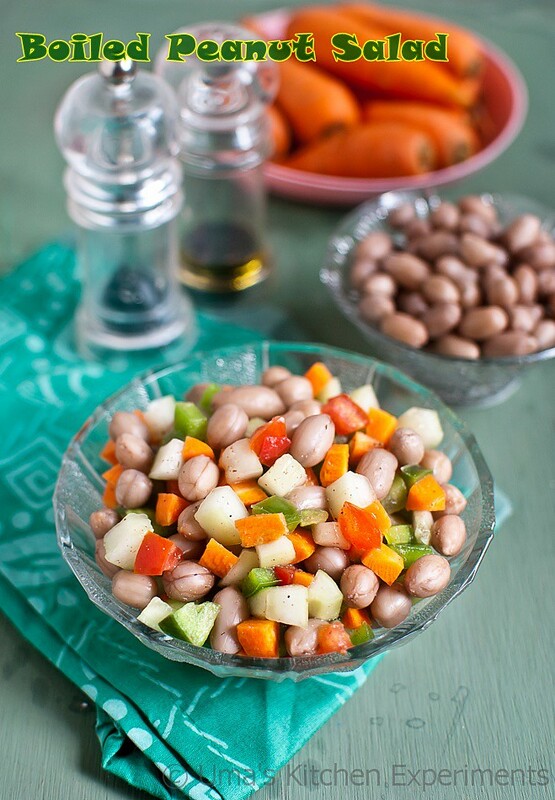 That's how this boiled peanut salad was introduced to us. It doesn't mean that I am new to it, but want to convey the changes from junk fries to a healthy salad. 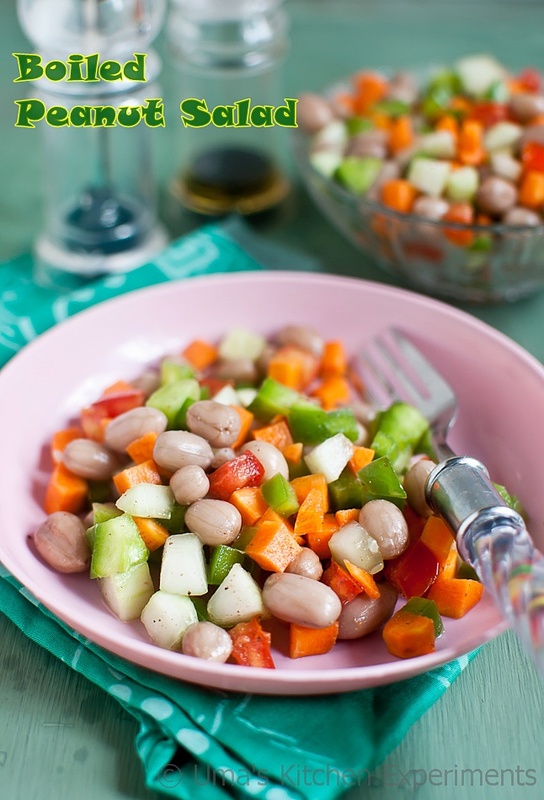 The ingredients that goes into this salad are very simple ones and aids me to prepare it often back at home for my family. I also prepare the same salad using mayo adjusting other spices. The options are endless when it comes to any salad. 1) Soak peanuts for 1-2 hours in water. After soaking, pressure cook it for 3 whistles adding some water(just to immerse) with salt. When pressure release, drain the water and set aside. 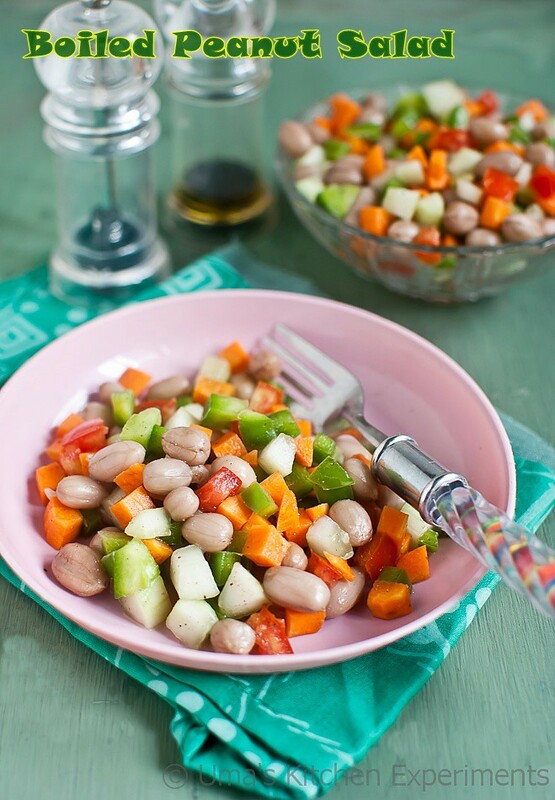 2) Chop cucumber, carrot, capsicum into a small cubes as shown in the picture. 3) Remove the seeds from tomato and chop into small cubes. 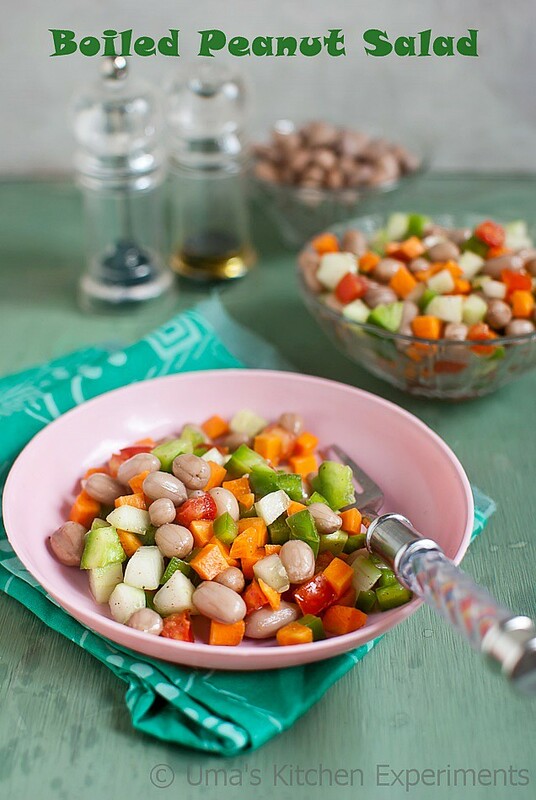 4) Transfer all ingredients (Boiled peanuts, cucumber, carrot, capsicum and tomato) in a mixing bowl. 5) Add black pepper powder, salt to taste. Add chat masala and lemon juice. Mix well. 6) Cover for 1 minute and serve. 1) You can either use boiled fresh raw peanuts or go with soaking the dry peanuts in water and pressure cooking it. Adjust the added black pepper powder and chaat masala according to your taste. 2) Serve the salad as soon as you prepared it, otherwise it tend to release water content. 3) You can also add cut mango or any vegetable of your choice to it.